BUTUAN CITY, Jan. 13 (PIA) -- Some 25 local government units in Region XIII have formulated a draft of their Disaster Risk Reduction and Management/Climate Change Adaptation (DRRM/CCA) Plan for 2012 during the DRRM/CCA Planning Workshop on January 11-12, 2012. The activity is sponsored by the Department of the Interior and Local Government (DILG), in partnership with Agencia Española de Cooperacion Internacional para el Desarrollo and the Local Government Academy under the Strengthening Local Governments of the Philippines (SLGP) Project in Almont Hotel’s Inland Resort, this city. The activity is designed to build the capacities of the members of the Local Disaster Risk Reduction and Management Councils (LDRRMCs) in the formulation of DRRM/CCA Plans. In her welcome address, DILG Assistant Regional Director Lilibeth A. Famacion encouraged the LGUs to strengthen their LDRRMCs to mitigate if not prevent destruction to life, limb and property brought by disasters due to climate change. She further said that disasters are inevitable and will eventually hit any place so the best that LGUs could do is to respond and adapt to the vast changing of climate to mitigate its destructive effects. “We don’t want a repeat of what happened to our neighbors Cagayan de Oro and Iligan Cities. You must be prepared at all times to fight back disasters like Sendong which can be likened to an unseen enemy, a thief in the night which strikes when least expected. Be prepared because it’s not Batman or Superman that can help us, but only us who must be prepared at all times,” she said. During the workshop, the participants were briefed on the salient features of RA 10121 known as “The Phil. DDRM Act of 2010 and NDRRm Framework,” Geo-Hazard Mapping, RA 9729 known as “Climate Change Act of 2009,” and the Government’s Plans and Programs for DRRM/CCA. The participants composed of Municipal Disaster Risk Reduction and Management Officers, Municipal Planning and Development Coordinators, Municipal Social Welfare and Development Officers, Municipal Engineers and Municipal Local Government Operations Officers assessed the vulnerability and capacity of their respective LGUs in DRRM/CCA which will gauge the latter’s success/performance in strengthening the DRRM/CCA. It can be recalled that a similar training was conducted by the Local Government Academy to eight (8) selected LGUs on September 7-8, 2011. 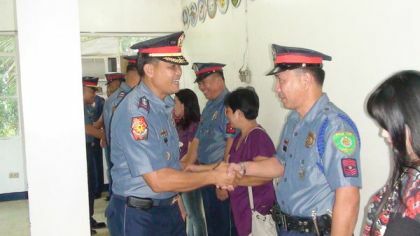 Another round of the same activity was also conducted by this Department on December 7-8, 2011 to fifteen (15) local government units.